The computer or the Disc Publisher does not recognize that the ADL-MAX is connected. The ADL-MAX is not being used even though it is connected. Two components need to be installed in order to use the ADL-MAX with a Disc Publisher. 1. ADL-MAX Driver. When you first connected the ADL-MAX to the computer you should have been prompted with a Found New Hardware wizard. As long as you clicked Automatically Install in the hardware wizard and you had the original installation disc in the computer's CD drive, the driver should have been installed. 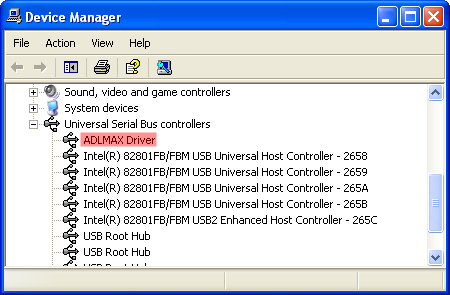 To check if the driver was installed, connect the ADL-MAX via USB and plug in the power adapter. Right click on My Computer on your desktop - Choose Properties - Click the Hardware Tab - Click Device Manager - Open the USB Section. ADL-MAX Driver should be listed. Note: To reinstall, right-click on ADL-MAX Driver and click uninstall. Now unplug power from the ADL-MAX and plug power back in after several seconds. The Found New Hardware wizard should appear. Install the driver using the installation disc or download it from the Printer Driver page. Hubs. USB hubs or pass-through ports on other devices are not recommended. Port Location. Even with onboard ports, always use the ports on the back of the computer. These ports are located directly on the motherboard. If you are using a front port, you are likely connected to a hub. It is just located inside the computer rather than outside. 2. Updated Robotic Files. 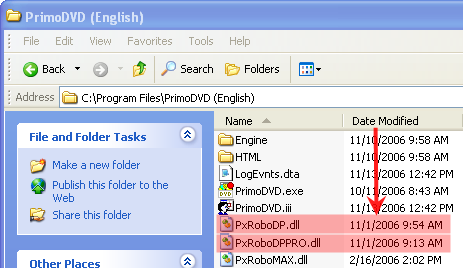 Make sure the Primo DVD Robotic files were updated. Open My Computer on your desktop - Choose the "C" Drive - Open the Program Files folder - Open PrimoDVD (English). Check that the modified date on both of the files shown below is 11-1-2006 or later. If the files are not updated delete and reinstall the latest version of Primo using the instructions in this article. 3. Update the firmware on your Bravo. This may be required for some Bravo products released before the ADL-MAX. Check the firmware update page. The ADL-MAX is not picking discs from the printer tray after the Disc Publisher prints a disc. How do I calibrate the ADL-MAX bins? How do I re-calibrate the Disc Publisher tray and drive(s) to the ADL-MAX? How do I load the ADL-MAX bins? How do I print only using an ADL-MAX and my AutoPrinter?